• A 2” layer of TitanFlex™ foam provides responsive contouring with targeted pressure point relief. • A 8” core of up to 1,189 individually encased Quantum™ Edge coils is divided into three zones for optimal spinal alignment: our responsive middle zone is 48% firmer to deliver support where you need it the most; two contouring zones, found in the upper and lower thirds of your mattress, provide deep compression support for your head, shoulders, knees and feet. Is Zoned the right bed for you? 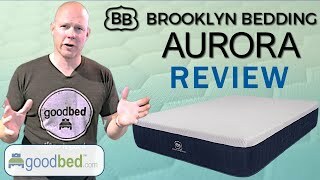 Do you have a Brooklyn Zoned mattress? Write a Review! There are no reviews on GoodBed for the Zoned yet. Be the first. Have a question about the Zoned? The Zoned is a tight top spring core medium mattress model released in 2018 that is manufactured by Brooklyn Bedding. Have an update or correction to our information about Brooklyn Zoned? If so, please take a moment to suggest an edit. Zoned mattresses sold by Brooklyn Bedding come with a 120-night in-home trial. Brooklyn Zoned mattresses are only available online or through Brooklyn Bedding stores. Click here to check for a location near you.